Chetan Bhagat is an Indian author, columnist and speaker, best known for his novels Five Point Someone, 2 States, and The 3 Mistakes of My Life. 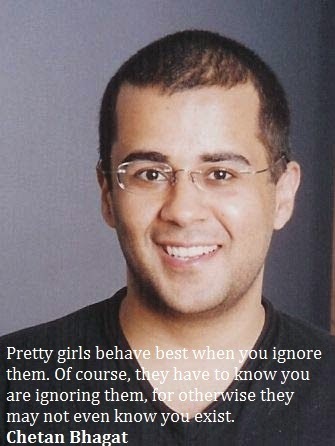 Here I have compiled down some of the best Chetan Bhagat quotes on love, and life. Don't be serious, be sincere. Forgiving doesn't make the person who hurt you feel better, it makes you feel better. In relationship there are always two types of person: one weaker and the other stronger one. It's never easier to live being as weaker one! Jealousy is a rather enjoyable emotion to watch. Life is not to be taken seriously, as we are really temporary here. We are like a pre-paid card with limited validity. If we are lucky, we may last another 50 years. And 50 years is just 2,500 weekends. Do we really need to get so worked up? It’s ok, bunk a few classes, goof up a few interviews, fall in love. We are people, not programmed devices. Pretty girls behave best when you ignore them. Of course, they have to know you are ignoring them, for otherwise they may not even know you exist. Stupid people go to college but smart people own them. The word “future and females is a dangerous combination. When a woman comes into your life, things organize themselves. Why should any guy want to be only friends with a girl? It’s like agreeing to be near a chocolate cake and never eat it. It’s like sitting in a racing car but not driving it.